The 10-inch precision TripleKut™ blade design cuts on push and pull strokes for smooth, clean, healthy cuts. Designed for gardeners with weak hands and mobility problems. 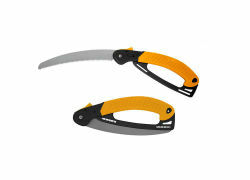 The hardened carbon steel blade safely folds and locks into handle for easy portability and storage. Comfortable molded non-slip grip adds comfort and control, making this tool an ideal choice for your cutting needs. Versatile Use For Work, Camping Or Backpacking, Double Non-Slip Grip Handle Makes For Safe Use. Perfect For Cutting Large Tree Branches.